The Problem: Each year, foraging and migrating sea turtles are accidentally captured, injured or killed by fishermen using longlines to catch tuna, swordfish, sharks and other species. A longline consists of a mainline 40 or more miles long with thousands of additional lines and hooks attached to it. The turtles either eat the bait and get hooked or become entangled in the lines. Some turtles caught on hooks or entangled underwater drown if they cannot get to the surface to breathe while other turtles are severely injured by hooks they have swallowed or which are imbedded in their skin. Every year longline fishermen around the world set more than two billion baited hooks. In addition to sea turtles, sea birds, juvenile fish, sharks and marine mammals are accidentally caught, injured or killed on longlines. Scientists estimate that hundreds of thousands of sea turtles are captured around the world by longline hooks every year. Many of these animals die from drowning or from their injuries after release. Most longline fishing occurs in the open ocean (pelagic longlining) in the top 975 feet of water but in some areas, such as the Gulf of Mexico, fishermen also set longlines on the ocean floor (bottom longlining). Species Affected: All sea turtles are affected by commercial fisheries, but loggerheads and leatherbacks are at greatest risk from longline fisheries because of their feeding habits. * Become an activist and support STC action alerts on fisheries. Case Study: In 2004 scientists at Duke University estimated that 250,000 loggerhead and 60,000 leatherback turtles are accidentally captured each year by commercial longline fishing. This study, the first global assessment of the problem, also reported that U.S. restrictions on fishing only account for about two percent of longline fishing and loggerhead turtles are 10 times more likely to get caught than leatherbacks. As a result of advocacy and legal action by U.S. conservation groups, the United States has become a global leader in reducing the capture of sea turtles and other non-target species in longline fisheries. During the last decade, NOAA Fisheries, sea turtle scientists and U.S. fishermen have conducted extensive experiments and significantly reduced encounters with sea turtles. In the Northwest Atlantic interactions with leatherback and loggerhead turtles were reduced by 65 and 90 percent, respectively, by switching from the traditional industry J hook to a larger circle hook (the end of this hook is turned inward). 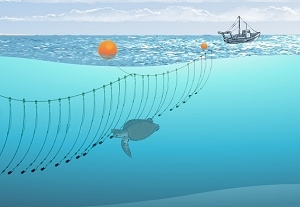 NOAA Fisheries now requires U.S. longline fishermen to use circle hooks, fish bait rather than squid (turtles are very attracted to squid) and to carry and use line cutters and other equipment to remove hooks and lines from accidentally captured turtles so that they can be safely released.